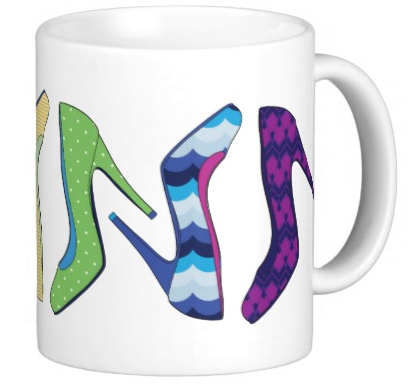 So, your mom texted me this morning via snap chat, and she said that she really wished she was drinking her coffee from a mug bearing stiletto heels in the colors of the rainbow. What else could I do but oblige? Firstly, how did your mom know about snap chat? I don't even have snap chat, and somehow she snap chatted me a photo of her sitting at the breakfast table in her zip-front robe, boring coffee mug in hand. Secondly, how did she get my number? Oh, right. We hung out when she was here for Labor Day. We went to a picnic at the the Teamsters' union hall. I thought it was strange, but that's where she wanted to meet. I think your mom is having her shower now, though, because she hasn't responded to my texts that this mug is ready for her! Anyway, if you talk to your mom before I do, just let her know that The Stiletto Rainbow Mug is available on the Zazzle Spinster Store now. I think I just got old. Hooray for One Whole Year!